Ask any lawyer about social networking, and you’ll hear the same thing: “LinkedIn.” Hell, ask pretty much anyone working as a professional or anyone in corporate America, LinkedIn is the place to be. Why? Because LinkedIn has made itself a wonderful combination of Facebook and Twitter – for business hours and serious business people. The stats are insane: 2 new members per second; 100 million users in the U.S.; 40% of users check the site daily; 3 million business pages; 2.1 million groups; 34% annual web traffic growth. It’s where you want to be for business-to-business (“B2B”) communication. Wow, suddenly you realize that you’ve been using LinkedIn to stand out as a professional. Using your LinkedIn Profile. Among 100 million people. 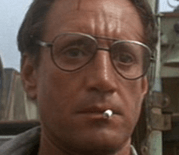 Turns out, you’re gonna need a bigger boat! 1) On-the-fly editing of all major elements of your profile. This may seem small. It’s not. In fact, one commentator described it as the biggest update LinkedIn has announced in the past year. Why is it such a big deal? It’s all about ease of use, combined with speed. Oh, and it turns out it used to be really hard to make any edits on a mobile device! Any of those spots you see the editor’s pencil? Yep, go ahead and change them on the fly! 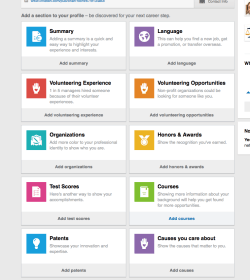 2) Easily add new categories to your LinkedIn profile to help stand out. So LinkedIn has four different types of paid memberships. But did you know that LinkedIn only gets 20% of its revenue from membership dues? More importantly, did you know it gets almost 60% of its revenue from Talent Solutions, a.k.a. recruiters and companies looking for qualified candidates? For a recruiter to find you, standing out is important. No! Your personality makes you who you are. Trust me, when a hiring partner is looking at 50 resumes, they’re all going to be qualified people. Whose interests show a personality outside of law review? Whose volunteer experience lines up with the firm’s philanthropic side? Who isn’t a complete douche-robot? One-click updates, and your LinkedIn profile now contains a TON of valuable information for potential recruiters. Add personality, improve your chances. Except test scores. Don’t add test scores. Seriously, if you add test scores, I hope that recruiters actively prevent you from ever getting another job. 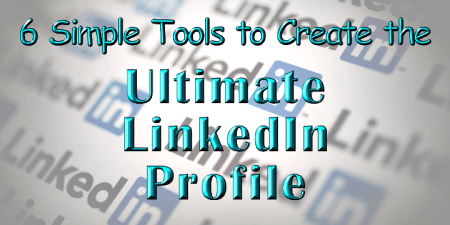 3) Quickly measure the strength of your own LinkedIn profile. LinkedIn recently added a whole mess of new ways to analyze your profile. Yep, you can find out exactly how effectively you’ve filled out your profile! Not that big of a deal, right? Well, it’s not just about your own profile. The bottom line is that a complete profile makes it easier to find you. Even if you’re not looking to be found by a recruiter, LinkedIn is the greatest communication tool ever created for professionals. If people can find you. Make it easy for them. 4) Get detailed analysis of why people view your LinkedIn profile. 5) Learn how your LinkedIn profile ranks against your connections. Ha! That’s right, they’ve added the sweet smell of competition to LinkedIn profiles! Wait, that’s the kung pao chicken in the kitchen. Well, it’s competition, so it’s fun anyway! Maybe that’s why “How You Rank” as rapidly become one of the most popular destinations on LinkedIn! Yep, you can see how influential your LinkedIn profile is among your connections! It’s a nice ego boost, no doubt, but there really is more to it than ego. The more your LinkedIn profile is seen, the more influential you are in your field. Moreover, if you pay for premium services, you can compare your LinkedIn profile against others in your company and, more importantly, influential people in your field. If imitation is the best form of flattery, you now have the best way to imitate. Or, on the other hand, if it’s all about competition, then let the games begin! I’m going to be ahead of you someday, Neal Robbins! 6) Take control of your endorsements. 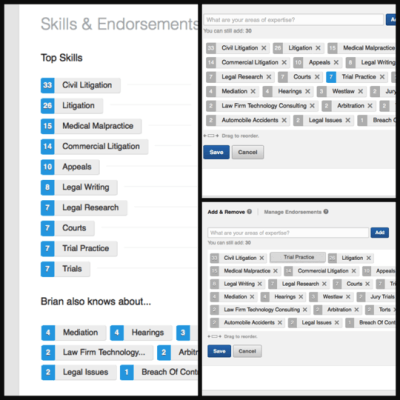 The “Skills & Endorsements” section of a LinkedIn profile really is the third rail of online lawyer profiles. Balancing the competing interests of wanting to advertise your experience, while more than a little paranoid about accidentally violating the Rules of Professional Conduct, ain’t easy. Fortunately, LinkedIn has made it easier to ethically manage your own profile. When you log in, click on the profile tab. Scroll down to your skills and endorsements, and easily edit those skills your connections have endorsed you for. Of course, you know first to delete any skills that, while someone felt you worthy of endorsement, you do not actually possess. It’s not just a good idea, it’s a Rule of Professional Responsibility! Yep, I’m going to keep saying it! 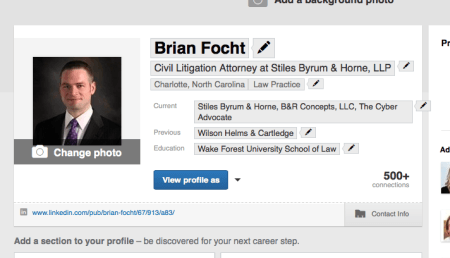 LinkedIn remains one of the most powerful tools for connecting and networking within the legal profession and beyond. In a world where everyone is online, you need to stand out. Hopefully these five tools will help you make sure you always have the ultimate LinkedIn profile!